The training task continued until mid-October 1944, by which time many hundreds of aircrews had been trained; including Squadron Leader David Penman who was awarded the DSO for his part in the magnificent low-level raid on Augsburg. The senior pupils from the unit represented Wymeswold in the historic 'Thousand Bomber' raids. No. 1521 (Blind Approach training) Flight and its Oxfords was additionally resident in 194344. Instead of the sight of the Wellingtons and Lancasters, Stirlings and Halifaxes, the Douglas DC-3/C-47 Dakota arrived with a new resident unit, 108 OTU. The 'Dak' found itself flying down the trunk routes opened through the liberated areas of Europe, the Middle East and the Far East. No.108 OTU disbanded in August 1945, and was re-named No. 1382 (Transport Support) Conversation Unit, which remained at Wymeswold, by now in 4 Group, until transferred to North Luffenham in December 1947. The increasing cost of maintaining jet aircraft was responsible for the disbandment of the Royal Auxiliary Air Force in 1957, and after almost three decades of service, No.504 Squadron disbanded on 12th February. After this the airfield continued for a time as a satellite station for RAF Syerston (from where in 1946, 504 Squadron had flown Mosquito aircraft). Syerston's aircraft were Hunting Provost trainers, later replaced by the Jet Provost and operated by the resident 2 Flying Training School. In the late '50s and early '60, these could be seen carrying out touch and goes (or '?circuits and bumps') as part of the training procedure for fledgling pilots. Runway resurfacing work at the nearby airfield at Hucknall resulted in Wymeswold being host to part of the Rolls Royce aircraft test-bed fleet between January 1955 and February 1956. Particularly significant among the Hunter F.1s and Canberras on Avon development flying were two Avro Ashtons – the first (WE670) had been modified with spray gear for icing trials by Napiers at Luton, made its first flight from Hucknall with an Avon RA14 under its belly, and duly landed at Wymeswold, from, where it was operated until February 1956. The 'Conway' Ashton (WB491), which had also been kitted out at Napiers, arrived in November 1955. In the late '50s, Field Aircraft Services obtained a number of overhaul contracts that were soon to bring a wide variety of exotically marked aircraft to Wymeswold. There began the overhaul of large numbers of European-based RCAF Sabres and T-33ANs (also the odd CF-100 Mk4.B Canuck) between early 1958 and late 1962. Another, brought a number of USAF and USN SC-54D Searchmasters and R5D-1s to be worked on in the lone 'black' hangar in the middle of the airfield. They were supplemented by numerous diverse civil contracts, involving Viking, C-47, Prince, President, Viscount, DC-4, DC-6, DC-7 and Marathon aircraft, as well as a lone Hudson CF-CRJ, which seemed to linger between March 1963 and May 1964. A decision by Field Aircraft Services to move their operation to the newly constructed regional 'East Midlands Airport' at Castle Donington was to prove the beginning of the end for Wymeswold as an active airfield, and by the end of April 1969, only three aircraft remained; a DC-3 (G-AMYJ), a 'Conair' DC-7 (OY-DFR) and a 'Bahamas Air' Viscount (VP-BCD), of which the latter had been in evidence since early 1967. Use of the airfield by 2 FTS was also wound up and, apart from a noisy three day field deployment exercise by six 1 Squadron Harriers from Wittering on 18-20 May 1970, the airfield has been very quiet ever since – punctuated only occasionally by the odd visiting executive aeroplane or agricultural aircraft, for example, the Cessna A.188B Agwagon G-AZYC of Mindacre, Norwich on 20th February 1976. In the early seventies, rumours circulated regarding the possible use of the airfield as an Army depot/airfield, but these did not materialise and it has been left to a small number of companies, including 'Brush' to keep the site alive. The outbuildings of the former RAF station formed a complex known locally as the 'Cliff' on the Melton Mowbray side of Burton on the Wolds. 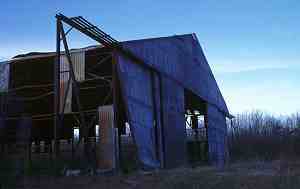 Although a number of the buildings had been demolished, some remained intact; the former bomb trainer, a two-storey building used to train bomb aimers remained in use as a boiler house, the old gun crew establishment was shared between Petters Limited and Brush Fusegear Ltd., who used it as a press shop. One of the five officer and crew rooms was used as Brush Fusegear's engineering department and one of the five rest and locker rooms used as the works canteen. 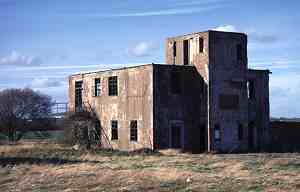 The building used for turret instruction on heavy bombers was also utilised by a commercial firm. Some buildings were demolished to make room for new development, the most important were two link trainers, also the former guardroom, the officers' car shed and the former W/T Centre. In recent years the airfield has been expanded to form a large industrial complex, housing many and varied companies, although the main area of the former wartime runway still remains largely intact. The former control tower still remains visible. The control tower, April 1997. 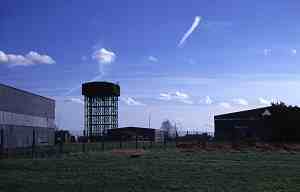 The water tower and industrial units, April 1997. All photographs by Bob Trubshaw. Originally published in Brush Aircraft: Production in Loughborough by Tony Jarrom (Midland Counties 1978). Text copyright Tony Jarrom. Photographs copyright Bob Trubshaw.